This mod lists all experiments and helps to deploy them fast and easy. How do I use the ExperimentTracker? This mod adds a button to the flight scene. 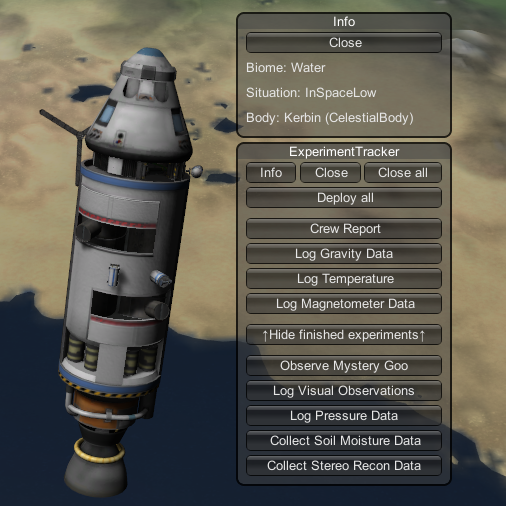 When active, a GUI is shown which lists all science experiments that can be deployed. You can deploy an experiment by simply clicking on it. Finished experiments can also be reviewed (left click) and resetted (right click). When inactive, the GUI is not shown and the button indicates whether there are experiments (yellow) or not (red). A click on "Info" toggles a GUI which shows some informations about the current biome, etc. This mod should be compatible with every science mod that uses the standard ModuleScienceExperiment interface or DMModuleScienceAnimate from DMagic. For KSP 1.1.3 download the mod here. Copy the GameData/ExperimentTracker folder to your KSP installations GameData/ folder. Thank you for this very useful mod ... I do the same with AGX but it will be good to use yours. But I didn't see the ET button. Which dependencies, I didn't read anything that ? Update the last versions for the dependencies and now it's working perfectly... so sorry for disturbing. Does this mod show only the science currently available , like [x] science does, and if so does this have the same irritating pause that [x] science has when changing biomes/situations and the list needs to update? 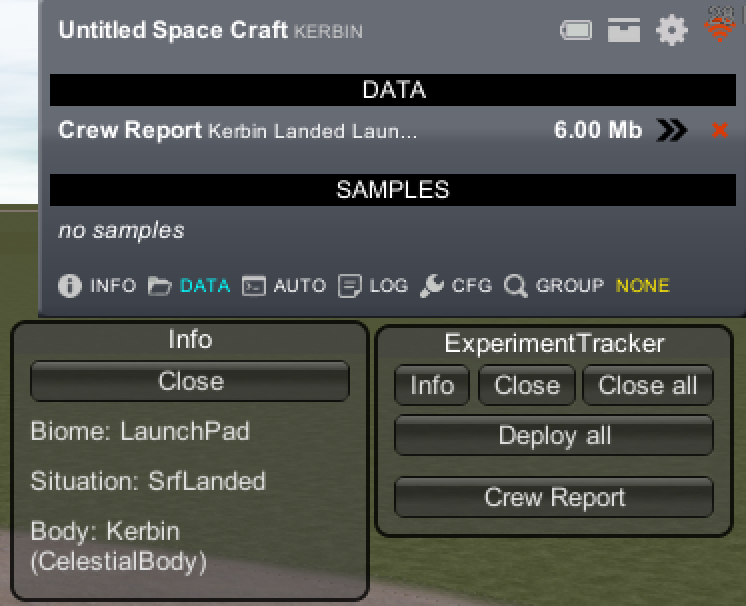 I think there's a compatibility issue with Kerbalism since the science data stored is not considered finished. Kerbalism replaces a lot of what the game does with it’s own stuff. Because of that, I don’t do any support for Kerbalism, sorry. 1.3.4.2 has an extra .version file in the MM_Configs folder. I can either fix the file, or do a version bump, but if I replace the file on spacedock, the md5 wil be off. Which do you suggest? The MD5 isn't saved until the version indexes successfully. And as of recently, the same is true of the download cache. So replacing it should be fine.